Welcome to Short Walks Short Walks is close to the beach, town and the city park An inviting front entrance hallway Personal space room located in entry hallway, perfect for reading Plenty of seating at the breakfast bar and table Stocked full of appliances and dishes Incredibly detailed kitchen with plenty of space for those who love to cook Family dining table that seats 6 There are 2 sky lights above the couch that offer natural lighting during the day. Great space to cozy up by the fire and watch TV Games for a family game night. View from living room of golf course Downstairs full bathroom with shower Downstairs King master bedroom with walk in closet and has an attached bathroom Attached bathroom with shower and double vanity Laundry room downstairs with room to fold on counter top Loft area is a good space for the kids to hang out Comfortable convertible full size sofa for extra sleeping if needed Upstairs queen bedroom Second queen bedroom Third Upstairs bedroom with 2 cozy queen beds Large walk in closets in every bedroom Books in the double queen room Bathroom between the queen bedrooms with sub and shower Fun garage with foosball table and ping pong table. There is also beach chairs. Ping pong table. Beach toys. Bring the marshmallows A quiet view of the golf course Personal view of the golf course from living room and patio BBQ for guest use. Great place to relax with the family. Beautiful Manzanita Beach less than two blocks from the beach Great sunsets on the beach just minutes away. The name says it all! The Short Walks home is just steps from the Manzanita city park, town, and less than two blocks to the beach. Located on the south side of Manzanita, Short Walks is a brand new four bedroom, three bath home built with family and comfort in mind. The house sleeps 12 comfortably and has a 12 max occupancy limit. The hard wood floors in the entry way carry through the open living room, dining room and kitchen. The large windows and skylights bring the outdoors in and really make this home light and bright. The kitchen cabinets are a conversation piece and really set the unique tone for the home. The living room has a cozy gas fireplace and large 50" smart TV with Netflix provided for guests. The large, solid wood dining table seats six with three additional seats at the kitchen bar. There is a king master bedroom on the main floor with large walk in closet, double vanity and shower. The laundry room around the corner has a mud sink for cleaning uup after a walk on the beach. Upstairs, you will find a loft with a full size sleeping futon and seating. There are three bedrooms on this level that share a beautiful full bathroom with tub and shower. Two of the bedrooms have queen beds and the third bedroom upstairs has two queen beds. The backyard has a gorgeous view of the golf course and a little stream on the outskirts of the property. The patio has an outdoor table, BBQ and a fire pit with plenty of lounge chairs. For some added fun, the garage has a ping pong table and foosball. Short Walks does not accept pets, but is a great home for kids and families. Come stay at Short Walks and enjoy your next Manzanita Beach Vacation! Steps to Manzanita city park, Less than two blocks to beach and one block to town. Gas fireplace in living room and gas cook top in kitchen. Didnt have to talk with anyone because your communications and directions at the home were exceptional! One of the most beautiful vacation rentals weve seen! Accessorized on a five star level. Location was excellent and all communications with Manzanita Beach Getaways was exceptional! So, so helpful! There was a slight misunderstanding about how many occupants were allowed, in an email, and it was handled right away. The code for unlocking the door had to be changed, but it only took a few moments. We needed two pack-n-play cribs (twin toddlers) and they let us borrow them instead of having to pack them. Everything about dealing with Danielle and the other staff was exactly what youd hope for. Its a beautiful, beautiful home and Im so glad we found it! The floor plan is well though-out and fit our large family so well. Having ping-pong and foose ball to play was a bonus. Weve stayed at a couple of homes over the years weve been coming to Manzanita, and this one is hands-down our favorite. It was so nice to be as close as we were to the beach, the park, and the shops. Just fabulous. Thank you!! Tell us about your favorite feature of the property. Layout, available sleeping spaces, proximity to the beach and the park. We appreciated the early check in (we arrived when the house was being cleaned, and were allowed to call the office to get early check in when it was ready). The keyless entry was convenient. I called on the last day of our stay to reserve for next year and this was an easy process. The email communication and reminders (prior to check in and check out) were helpful. We have been coming to Manzanita for 16 years and have stayed in a number of properties. 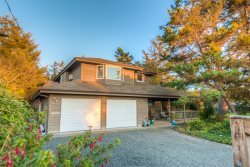 This was one of our very favorites because of the house itself (large, bright, airy, clean, quiet, well stocked), its amenities (yard backing onto golf course, fire pit, ping pong, food ball), and its location (close to beach, park and main street). We highly recommend this home. My only suggestion for this property is that you update the photos of the yard on the website. The yard has been totally redone since the photos were taken and is really beautiful and inviting now. I appreciate the honesty about a house to fit our overall needs for a large group! While Short Walks is a fantastic house I wouldnt rent again with teens (and) little kids - the space was great but the acoustics were terrible - couldnt get the little one to sleep to save our life (teens need a bit more privacy/sound proofing)! (This house is perfect for one family and/or older guests overall and Id rent this place again in a heartbeat with another couple and/or for an adults only time away). We found them helpful and able to answer our questions quickly during the booking process. We've fallen in love with Short Walks. This house is the perfect set up for our families and it proximity to everything is top-notch. We are looking to rent it again in July 2019. Can't say enough good things about it. We loved this house....beautiful!!! We have stayed in other homes in Manzanita through other rental companies and did not have the most pleasant experiences. Will definitely use your company again. Looking forward to more family reunions. Everything was impeccable! What a perfect location and most wonderful house!! !